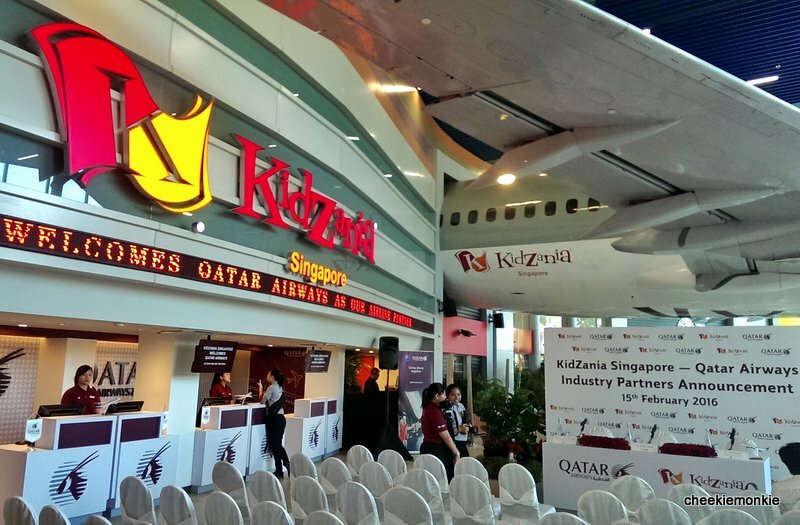 Arrival Confirmed: KidZania Singapore Lands on Sentosa via Qatar Airways in April 2016! 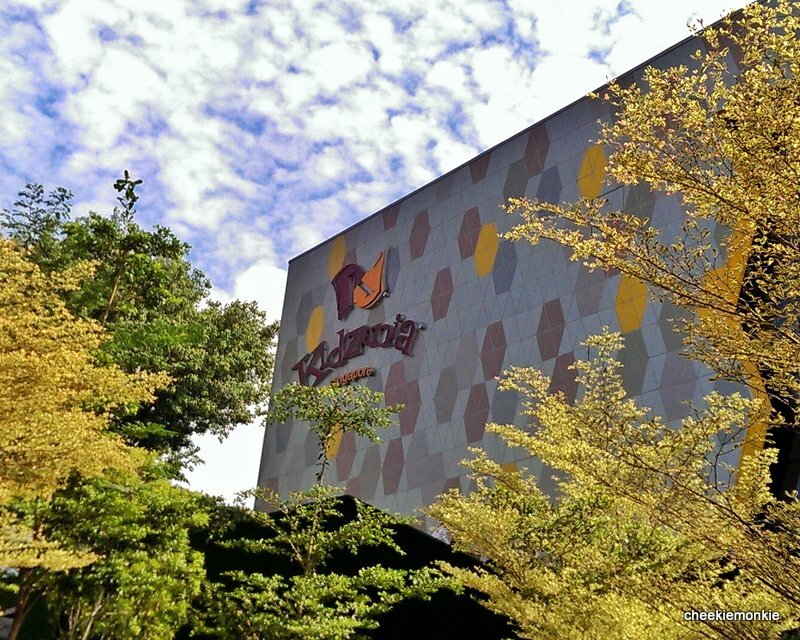 KidZania Singapore will finally be opening in April 2016! Originally slated to open at the end of 2015, the huge family edutainment centre had some delays along the way but the completion is now in sight. Which is fantastic news really, considering the I have been documenting its progress since its announcement in January 2013. Unlike the usual theme parks, this indoor facility comes with NO rides or arcade attractions at all. Instead, kids get to participate in a variety of role-playing activities specifically designed to educate and inspire kids aged 4 to 14, creating a kid-centric city experience from arriving at the airport, to visiting a city centre and exploring the city streets. On top of it all, they get to earn a salary (in the form of kidZos, the official currency of KidZania), pay for goods and services and manage an ATM card - all the things they see adults do in real life! Take charge of a 7-Eleven Convenience Store as a store owner and be a cutting-edge entrepreneur. Or be a financially-savvy shopper and learn to spot the best deals while maximizing the budget. As a food scientist at the Abbott Milk Innovation Lab, children can learn about the science and processes behind how growing up milk is made and create their own packages of growing up milk. Learn the importance of having protection and savings plans to help other kids take care of themselves and their loved ones as a financial services consultant at AIA Insurance. Mini fashionistas become fashion gurus at the Camouflage Fashion Boutique as they learn how to curate their own fashion style, and gain confidence by modelling their handpicked outfits in a fashion show. Test their courage, confidence and hone their psycho motor skills as a mountaineer with Camp Challenge. Maneuver through obstacle courses and persevere in their quest for the summit. Offer the gift of healthy sight as an Optometrist at Carl Zeiss & Nanyang Optical, where they can give advice on how to select the right lenses and frames. Ensure their own eyes are in top condition with an eye check and learn how to care for their own eyes. Be a petrol station manager at an Esso Petrol Station and help fill up vehicles for customers. Kids can learn more about the different types of fuels used to power vehicles on our roads, and the importance of good customer service. Be a junior nurse at Johnson & Johnson’s nursery, kids are tasked to take care of newborn babies, learn the basics of diaper change, baby massage techniques and the benefits of baby moisturisers. Children who visit the KFC Restaurant will play the role of a KFC Crew member, learn the importance of hygiene in the Food & Beverage Industry, prepare a KFC meal and bring it home to enjoy! Go on air as a radio DJ to play chart-topping songs, present the news, and co-host programmes with Kiss92 DJs, and bring a copy of the recording home. Be a Health Institute Researcher at Lifebuoy and learn the intricacies of soap making along with the importance of hand hygiene through first-hand experience of making their very own soap. Be a Traditional BBQ meat specialist and discover the secret recipe that goes into the age-old process of making one of Singapore’s best loved traditional snacks at Lim Chee Guan Traditional BBQ Meat Store. Be a surgeon and perform a delicate kidney transplant operation in a fully furnished operating theatre at the city’s very own Mount Elizabeth Hospital, and learn important health practices. Visitors to the Nickelodeon Acting Academy and Theatre will get to role-play as their favourite Nickelodeon characters. The aspiring thespians will be able to attend acting classes at the Acting Academy, wear character outfits and then perform for an audience at the Theatre. Be an ice cream maker and mix delicious flavours and ingredients at the Paddle Pop Ice Cream Factory. Kids will learn about nutritionally responsible snacking before enjoying yummy treats. Together with Canon, Pictureworks aims to capture the best memories of visitors in KidZania Singapore, with photo printing services for visitors to purchase in the form of photos, stamps and even key chains. Young chefs will get to knead and shape pizza dough, add on their favourite toppings, before sending it to be baked at the Pizza Hut Restaurant. They will also be able to pack their pizzas into boxes to take home and enjoy with their family! The Spritzet Bottling Plant offers children to play the role of an engineer, learn safety and hygiene matters, how natural mineral water is made, and the ingredients and processes that water has to go through before it is bottled and dispatched. Create their own candy as a Candy Specialist and bring hand-made candy home at the Sticky Candy Store. Perform an oral hygiene health check to prevent cavities and flash a bright smile as a dentist at the Sunstar Dental Clinic. Be a Museum curator and docent at The Intan, Singapore’s first private Peranakan home museum. Appreciate the traditional Peranakan culture by curating galleries that focus on iconic Peranakan elements such as the sarong kebaya, nyonya porcelain and Peranakan tile architecture, and proudly share Singapore’s rich Peranakan identity with visitors through the galleries and exhibits. The Learning Lab University will be the gateway for children to acquire distinguished academic credentials. Armed with these prestigious qualifications, they can earn extra KidZos at selected establishments. Be a radiologist at the Toshiba CT scan room, and analyse scan results while operating a functional CT scan machine, and learn the importance of early detection. Visitors can enjoy authentic Indonesian cuisine in the Warung M Nasir cafeteria. At the WTS Travel counter, visitors can choose to be either a Tour Guide or purchase a ticket to be a Tourist for an in-depth city tour of KidZania Singapore. Each tourist is allowed to be accompanied by one adult to go on the tour with them. This is one of the activities that parents are able to participate with their children. Districts will be set up within the kid-sized city to group partners based on the nature of the establishments and role-play activities. All in all, there will be a diverse range of over EIGHTY role-playing activities within KidZania Singapore! All well and good, but one extra thing that KidZania places a huge emphasis on lies in the COMPLETE experience that it offers to its young visitors - starting right from the moment they step into KidZania Singapore. Upon arrival at the Palawan Kidz City situated opposite Port of Lost Wonder, the first thing that will definitely catch the eyes of the kiddos is the life-sized decommissioned Boeing 737 plane right above the entrance. KidZania Singapore has partnered Qatar Airways as its latest Industry Partner and of all the 22 KidZania cities worldwide, KidZania Singapore boasts the honour of being the ONLY KidZania to showcase the full fuselage of an actual plane within the centre! 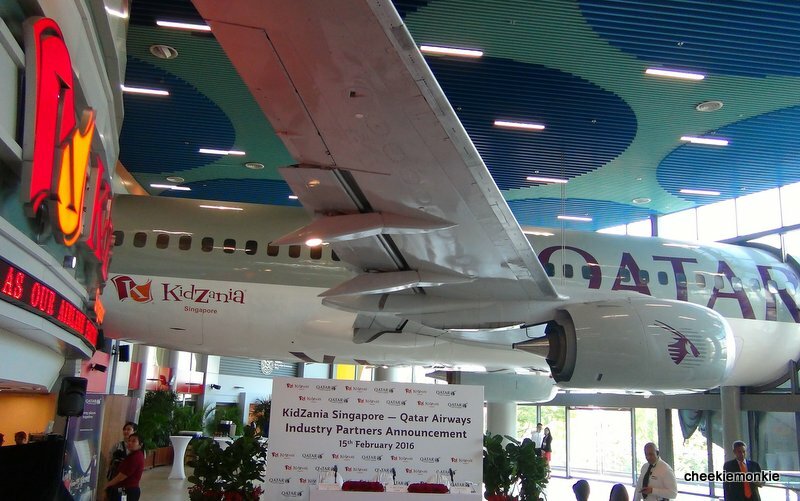 As KidZania Singapore's aviation partner, Qatar Airways will bring realistic aviation role-play‎ to kids which really begins from the moment they receive the entrance tickets. You see, the ticketing counter are done up like just an airport check-in counter, and tickets will be issued in the form of Boarding Passes. So going to KidZania Singapore will be just like heading to an overseas trip and to complete the experience, kids will also be handed their very own KidZania Maps to navigate and for sure, they will be more than eager to take flight! Upon entering KidZania Singapore proper, kids can make a beeline to the Aviation Academy where aspiring pilots can experience flying two of Qatar Airways' flagship aircraft - the 787 Dreamliner and the A380 superjumbo aircraft - using the state-of-the-art simulators! The flight simulation facility is specially designed to demonstrate taking off and landing at Qatar Airways home base and hub, Hamad International Airport in Doha and Singapore Changi Airport. Other than being pilots, the positions of cabin crew are open to kids too where they will learn how to ensure the safety and comfort of passengers on-board. And who are the passengers, you ask? Parents, of course! One of the unique features that sets KidZania Singapore apart from the other KidZania facilities is parents will be able to join in the fun and role-play as on-board passengers and let their kids serve them! Can't wait to ask for a cup of drink from Ale. Heh. A part of the new Family Entertainment Centre development at Palawan Beach on Sentosa, KidZania Singapore will be a 7,600 square metres facility and the first KidZania facility to be located on a resort island. And as the monkies will tell you, we can hardly wait! For more information, visit www.kidzania.com.sg.